Back in Fairbanks I'd shot off e-mails to a couple fairs the weekend before the Tanana Valley State Fair, offering to do a free show if they wanted one. 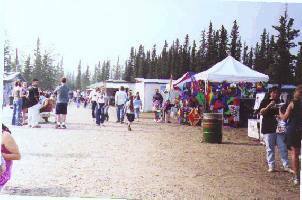 In Willow, I'd gotten a reply from the Deltana fair in Delta Junction inviting me to play. My friends from Willow were having a great time following me around and being part of the scene, and KK was getting into running the videocam. They decided to come with me all the way to the Deltana fair, and bring supplies to a mutual friend stranded up near Cantwell. So Friday, after playing at Meads, I packed up the recording gear and headed north to play at H&H Lakeview Lodge outside Talkeetna that evening. After that show, we still drove a chunk north to Cantwell Lodge, where some friends of ours, Yukon Ryder, were playing, showing up in time for the last set and a few hours sleep. In the morning I was on my way alone to Delta Junction, while K.K. and co. diverted to drop the supplies off. I arrive about 1:30 pm Saturday. They asked if I could start immediately, so I drag out the dulcimer, tune up and start playing at 2 pm. It was a small, friendly, down-home country fair. I enjoyed myself. My friends caught up with me late saturday night. I did a stage show each day and set up to play "the street" in a space between some of the booths. I am back in my element, I am more akin to the street than the stage. The stage is only a small part of what I do, and to me not really the most important. I am more at home out on the street, down among the people, singing and talking, entertaining, and reaching people. It is a timeless role, the minstrel, the bard, the troubadour, the folksinger. There was a great scene where an old guy stopped and played harmonica with me, western melodic style. It sounded perfect doing a song like "Old Paint". Sometimes the main stage was quiet, and sometimes too loud to play over, and sometimes I could jam with the band. At the end of the fair, I had a great time jamming with the final band's set. I plan to visit them sometime and jam again seriously, as I keep on looping around Alaska. Monday morning I take my usual final walk around the deserted fair, watching the load up. Its a special time for me. The fair, even as it moves from place to place, is one of the "homes" I have had, where I belong. I know it in all its facets, the load-in and the load-out, thronging with people or deserted and empty, sunny days or rain and mud. My kind have had a place here for thousands of years. The Fair is as real and changeless as it is impermanent and mobile, just like a folksinger. The trucks roll away and we do to, down the highway south this time, to take the Denali highway on the way back to Willow for a couple days rest.